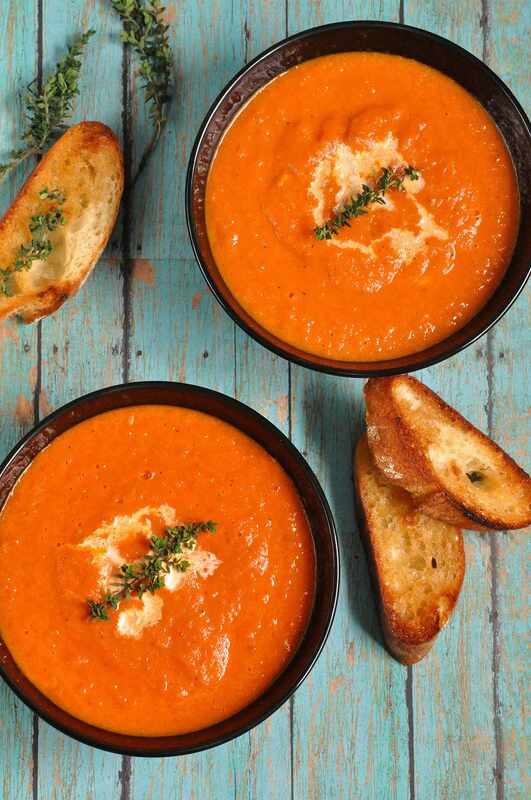 Yes, you can make a great tomato soup with your grill. The secret is to let the grill flavor the tomatoes instead of blanching them in boiling water. This soup can be served hot or chilled. Clean and preheat your grill. Your cooking surface needs to be really clean. Combine olive oil with salt and pepper. Cut tomatoes in half and lightly brush the cut side with the olive oil. Reserve remaining olive oil for later. Place tomatoes cut side down on a medium-hot grill. Close lid and cook for about 3 to 4 minutes. Remove tomatoes from grill when they are browned and the skin is loosened. Set aside to cool. When the tomatoes are cool enough to work with, remove the skins and seeds. Chop shallot and mince ​the garlic. Heat a small skillet with about 1 tablespoon (15 mL) olive oil. Saute shallots on medium heat for about 3 minutes. Add minced garlic and cook for another minute or so. Promptly remove from heat and place in a blender or food processor along with tomatoes, basil, reserved olive oil, and remaining ingredients. If you choose to serve this soup chilled place it in the refrigerator for at least 2 hours. The flavors will blend over time so overnight is better. If you want the soup hot, transfer it to a large saucepan and bring to a light boil, reduce heat and let simmer for 8 minutes, stirring often. Add a little water if the soup is too thick. Once cooked through, remove from heat and serve immediately.